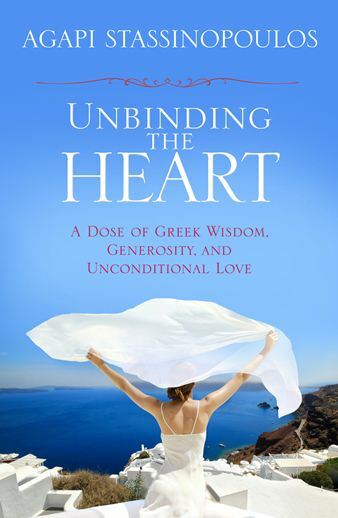 In her new book, Unbinding the Heart, out February 1st, Author and Speaker Agapi Stassinopoulos shares with us inspirational stories about her life and her amazing mother. She shows us how she found her way back to herself, discovering the golden opportunity we all have in the midst of life’s challenges, to not shut down, but to keep our hearts open to our possibilities. Why are some people spiritually bankrupt and others have abundance ? Everyone has spirit inside of them. When we were born, we all took in the same breath. I don’t think that God made a distinction between who receives spirituality and who does not. Spirituality is inherited in all of us. However, I think we all have different yearnings and callings and we have different lessons to learn. I think it’s important to know that the choice to choose spirit is available to all of us, at every moment. It’s a question of whether we exercise that choice and where we put our focus. We have the choice when we get up in the morning to either focus our attention on what we are going to get from life or how we are going to survive or we can take in our next breath, take in the gratitude, and give thanks for being alive. And that choice in itself is a spiritual action that can begin to fill us up. From then on it is a choice of how much deeper we want to know Spirit (God) and do we want to dedicate more time and energy to discover more of that. For me, it was a very deep inner calling to find the spirit within me and I made it a priority. I wanted it as much as I wanted my next breath. Please explain the difference between wealth and being Rich? In one of the chapters of my book, called Mummy, Are We Rich, I asked my mother one day if we were rich because I used to see people who had material abundance around me. My mother replied by saying that we were wealthy and she proceeded to describe wealth as having a spirit of generosity, having talents, being educated, having a beautiful family and having the basic necessities of life. Wealth is described as the quality of life rather than the material. Being rich, on the other hand, means that you have a lot of money. But consciousness of wealth is really being able to see the abundance that is available in our lives and then deciding how much value “being rich” holds. Why are some people able to move forward quickly from negative situations and others are having trouble letting go? I think negative situations create a lot of drama and so many of us are addicted to drama because if there is no drama in our lives, we feel empty and bored. On the other hand, there are people who would rather spend their time avoiding drama and embracing the positive emotions and as a result, creating positive situations. I think it is important to remember that if we find the wit to let it go, there are many positive things we could be creating instead. And God knows this planet needs more positive people who create positive actions. Why is trust and loyalty diminishing in our current culture in both personal and professional relationships? The more insecure we feel about the unknown factors in our lives, and there are definitely many, the more we start to mistrust ourselves and place our loyalty in outer circumstances, rather than being in integrity of our own values and holding ourselves accountable for our own outcomes. How did you protect yourself from the challenges of working in the entertainment industry as an actor and producer? I think the entertainment industry is a huge set up for us to build our inner strength muscle because we are constantly being tested. For me, at some point, I had to create my own vehicles to perform and produce because I wanted to be in a leadership position and not rely on so many other people to hire me or say yes or no to a project. I became wiser in the process and let go of a lot of projects that were not working and picked up projects that had more possibility. In a sense, instead of protecting myself, I created my own reality in the entertainment industry. Your Greek heritage has served you well. Tell me more about goddesses and Greek mythology as it applies to day to day life? In both of my books, I talk about how the Greek archetypes of the Greek Olympians still lives as part of our every day psyche. They represent different qualities and aspects in ourselves. I found tremendous value in writing and performing them and sharing them with other people because they are a fundamental structure of our fundamental psychology. For detailed information, please refer to my two books, Conversations with Goddesses and Gods and Goddesses in Love. Each day is a new day and with that a new challenge. How do you wake up optimistic and positive? I don’t always wake up optimistic and positive and if you know anybody who does, would you please introduce them to me! I think that there are so many factors about how we wake up in the morning: what we ate the night before, how our dreams were, what we may be holding onto from the days or weeks before. I am very passionate about getting up and, other than having a really great cup of coffee, making God my partner and calling forth the higher power. After all, somebody is breathing me and whatever you want to call that, there is a higher power that is making my body work. And I have various techniques and tools to attempt to connect with that energy so that I can carry on throughout my day. Explain the difference between wanting and longing? In it’s simplest terms. Longing is something that stops you from being proactive because it makes you become lost in your own emotionality of wanting something. In other words, it is the dramatic version of wanting. Wanting gives you the opportunity and motivation to go get what you want without any added drama. Does compassion play a big part in understanding the human condition? Compassion helps us endure the human condition and be more at peace with it. When you see great suffering in the world, you may not understand it but I think you must be compassionate without needing to understand. I think that first we must have compassion for ourselves because then it is easier to accept our conditions, limitations, and weaknesses and then strengthen ourselves from that place. Explain the positive impact of comforting and helping others? It is the best mood boost you can possibly imagine. I always say that if you are down and depressed, feeling out of sorts, can’t figure out what to do next, just go help someone, anyone, anywhere! Smile at the cashier at the Market, visit ill people at the hospital, hold babies! It is the most empowering thing you can do because you activate yourself and you suddenly feel valuable. Unbinding the Heart is published by Hay Books and is available in all bookstores February 1st. For more information, visit www.unbindingtheheart.com.